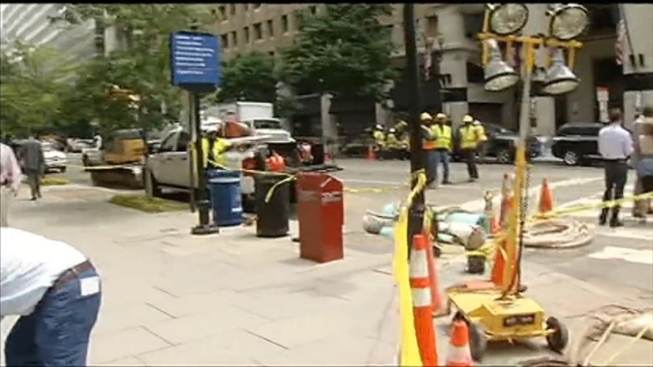 The northbound lanes of 14th Street at F Street in downtown D.C. should reopen in a couple of days. Northbound 14th Street NW is closed between Pennsylvania Avenue NW and New York Avenue NW and F Street NW is closed between 13th and 15th streets due to repairs to a sink hole that developed a week ago. An undetected broken storm drain eroded land under 14th and F, causing a cave in that ruptured a sewer pipe from the 1890s, DC Water said Tuesday. Repairs are complex. About three-fourths of the intersection needed excavating so crews can fix the broken storm drain, and a second hole developed about 30 feet away. The cost to repair is almost $2 million, in part due to crews working around the clock. The D.C. Department of Transportation advised morning commuters to avoid using the 14th Street Bridge to enter D.C. while repairs continue.